Robbery is no minor crime. It is a serious offense punishable by very severe penalties. Most of those are outlined in Massachusetts General Laws Chapter 265, et seq. In Massachusetts, a person convicted of unarmed robbery may be punished by a state prison term of anywhere from a few months to several years to life imprisonment. A second conviction carries a mandatory minimum sentence of two years imprisonment (M.G.L. c. 265, §19). An important point before beginning any discussion of Massachusetts robbery charges: As stated on my Massachusetts burglary charges page, burglary and Massachusetts robbery offenses are not the same! While they share some common legal elements, the two charges, and the penalties attached to each, are distinct from each other. Let's get to the definitions of this particular crime. There's a commonly used short one and a statutory long one: The easy, short one is that robbery is stealing from someone through the use of force or the threat of force. An even shorter definition? A "stick-up." That's a little too simplistic, so let's examine the legal definition of this crime. As with larceny, burglary, motor vehicle theft/grand theft auto, or any other Massachusetts theft crime, the crime of robbery involves certain defined legal elements, each of which must be met and proven by the commonwealth (the prosecution) beyond a reasonable doubt in order to obtain a conviction. First, the legal definition. Robbery is: (1) A larceny (2) from the person (3) by force. "Larceny": This is an unlawful taking or removal and transporting or carrying away of another person's property, with the intent to permanently deprive the owner that property. Note that larceny is the first element of robbery - but larceny is not the offense here - robbery is. With the crime of robbery, larceny is what is known legally as a "lesser included offense", and importantly, a defendant cannot legally be convicted simultaneously of both the crimes of larceny and robbery from a charge of robbery. "From the person": This typically infers a person's physical body or clothing, but there is some flexibility here: It also includes situations and circumstances where the robbery victim did not have the stolen property directly on his person, but where he would have retained control over the stolen property if the defendant had not used force or the threat of force. A classic illustration involves a clerk at a store who is held up at gunpoint. In such a situation, the victim doesn't obviously have the cash register in his pocket or on his person, but the legal element of "from the person" element would be met because the clerk had the right to maintain control of the cash register and would not have surrendered the register's contents if not for the force or threat of force used by the defendant. "By force": This element can be established through either the use of actual force (such as an assault or battery or even just the threat of force, without the actual use of it. Intimidation alone can also satisfy this element. Furthermore, a special statute states that where force is actually used, overt fear doesn't have to be simultaneously present (think of an extremely brave victim who hands over his cash just because he doesn't want to be shot, even though he isn't really scared,) and on the other side of the coin, where fear is present, but not force (think of an extremely fearful person who becomes afraid and relinquished his cash or property even though no force is used.) That statute is Massachusetts General Laws Chapter 277 Section 39. A defendant convicted of unarmed robbery in Massachusetts can received a variety of punishments. These can range from a relatively brief sentence to life in prison. Even a second conviction on a robbery charge, carries a mandatory minimum sentence of two years in prison. (G.L. c. 265, §19). Sentencing options are fact and circumstance-driven. If you would like a more detailed discussion of what penalties might apply in a given situation, call us at office ph. : (781) 320-0062, or Attorney Kickham's cell phone: (617) 285-3600, or email us here with some details as to your question, and we can provide you with a free initial phone consultation to discuss the particular facts involved in your question. Armed robbery is an offense separate from "ordinary" robbery. It is similar in that it contains all the legal elements of robbery discussed above, but adds a fourth element that the robbery must be committed with the use of a dangerous weapon. A "dangerous weapon" could be a variety of things; it doesn't necessarily have to be a gun or a knife. 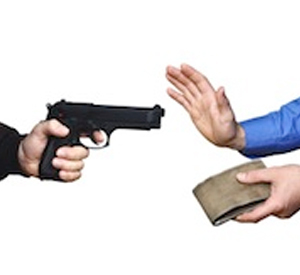 If a defendant assaulted or battered the victim, the prosecution may also apply the charge of armed robbery. The sentencing penalties and punishments connected with this crime are very serious - and include the potential of life in state prison. These important definitions and punishments are set out in Massachusetts General Laws Chapter 265, Section 17. Important distinctions between the commission of a robbery vs. an armed robbery make for critical differences in sentencing. One example: If the defendant is alleged to have hidden or distorted his identifying features, such as through the use of a face mask, a first offense will carry a prison sentence of not less than five years if convicted. A second conviction will carry a punishment of not less than ten years in state prison. In the event that the "dangerous weapon" used in the alleged commission of this crime was a firearm such as a shotgun, a rifle or a machine gun, the mandatory minimum sentence is five years in state prison. The mandatory minimum sentence increases to fifteen years if convicted on a second offense of armed robbery. "Mandatory minimum" means just what it says: Upon a guilty finding, a judge has no option but to sentence a defendant to at least the minimum term called for by statute. The penalties for robbery, burglary, armed robbery and other Massachusetts theft crimes, make it clear that the legislature, District Attorneys, the courts and judges do not take these crimes lightly. Boston, Massachusetts Robbery Crimes Attorney: Why hire the Law Office of Attorney William D. Kickham To Defend My Burglary Charge? If you or someone you know is being investigated for or is charged with a Massachusetts robbery crime, that person is going to need to retain a talented and experienced Massachusetts robbery defense attorney - one who can demonstrate a proven track record of success in defending charges of robbery and armed robbery in Massachusetts. To choose an attorney who only handles these cases "now and again" is a foolish decision, and anyone who does so, or who chooses an attorney based upon the lowest fee possible, is inevitably going to be sorry. In the legal profession as in any profession, "you get what you pay for." Don't make that kind of mistake. While our fees aren't among the lowest, our talent is among the highest. We know how to aggressively defend Massachusetts robbery charges, and we can protect you from Day One. Call us 24 hours a day, seven days a week at Ph. : (781) 320-0062, or contact us online for a free initial consultation, and we'd be glad to let you know what your legal options are, and what we can do for you.